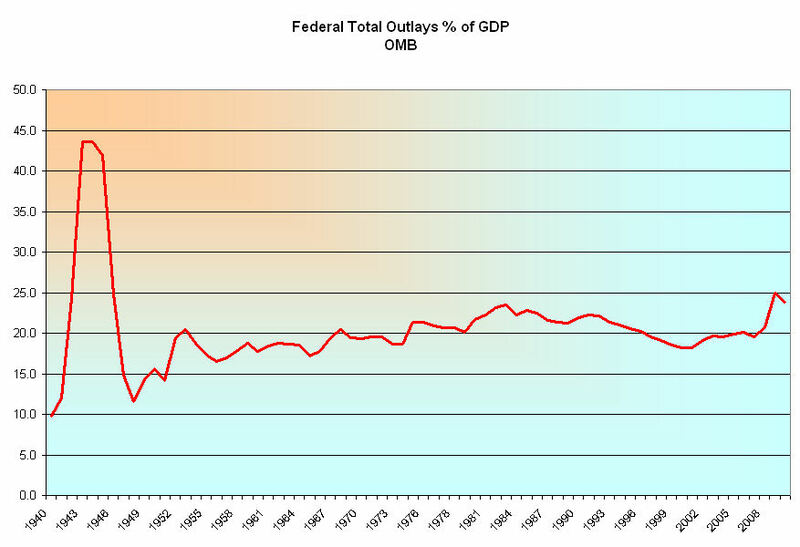 The chart below shows a 70 year history of total federal outlays, including any social security payments. 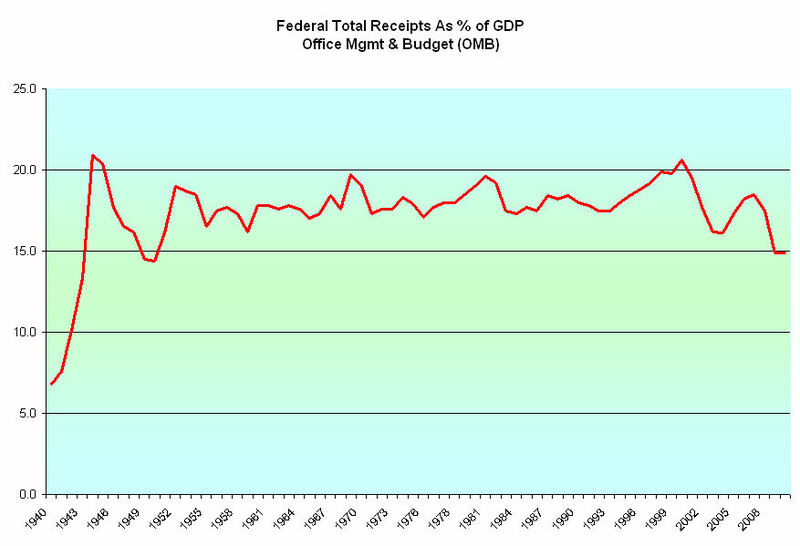 Spending in this past year was about the same level as under President Reagan in 1984. It was too high in 1984 and 2010 but it is not at catastrophic levels, despite what you might hear. When spending rose under the Reagan administration, Democrats sounded the alarm. Now it is the Republicans turn to sound the spending siren on the Obama administration. The problem is both spending and revenue. Spending needs to come down a few percentage points to a historical average of about 20% and revenue needs to increase to historical averages of about 18%. 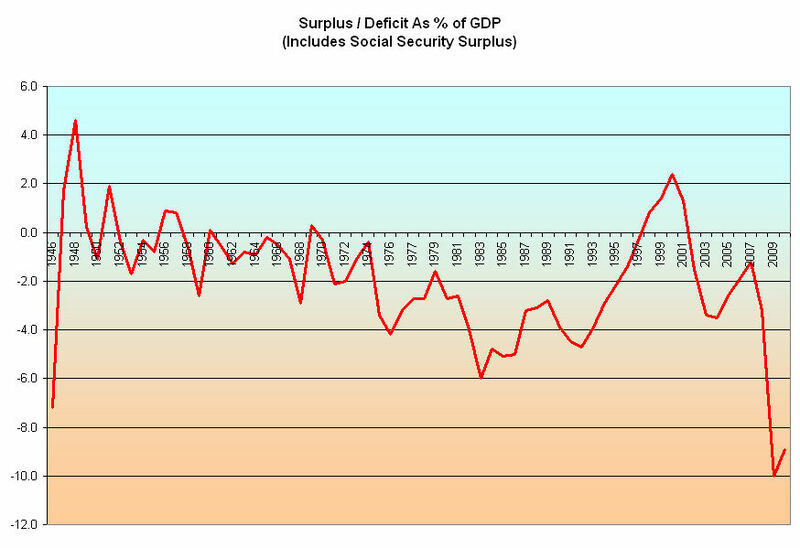 The chart below shows the 65 year history of the annual surplus or deficit and the current extent of the problem – it’s a big problem. The longer term problem are those historical averages. Over several decades a country can not continue to spend 2% more than it collects. The rational agreement would be to target federal outlays at 19% of GDP and increase revenues to the same amount. Rational discussion takes leadership and courage, something that has been sorely lacking in Washington. Our representatives have become poll followers, pandering to voters who turn like a weather vane in the economic wind. This is why I support term limits!